We all know very well that the well-known Chinese smartphone manufacturer, of course, I am talking about the OnePlus who launched its latest flagship killer, of course, OnePlus 6T at the end of October 2019. However, now according to the latest reports, the well-known Chinese flagship maker, of course, OnePlus to launch its fastest OnePlus smartphone. We all know very well that the well-known Chinese smartphone manufacturer, of course, I am talking about the OnePlus who launched its latest flagship killer, of course, OnePlus 6T at the end of October 2019. This flagship killer of OnePlus, of course, I am talking about none other than OnePlus 6T was launched in two colors, one is black with a glossy glass finish, and another one is black “midnight” with matte glass. But, apart from these two colors the well-known Chinese smartphone manufacturer, of course, OnePlus also recently launched a brand-new purple version of OnePlus 6T last week. However, now according to the latest reports, it seems that the well-known Chinese flagship maker, of course, OnePlus to launch another brand new special version of OnePlus 6T. As the well-known Chinese smartphone manufacturer, of course, OnePlus has recently announced another new special edition of OnePlus 6T in an official agreement with the brand of luxury cars McLaren, yes, I am talking about the new McLaren version of OnePlus 6T which is expected to arrive in the coming weeks. While now if we talk about the other brands then let me clarify that the well-known Chinese smartphone manufacturer, Huawei has an agreement with Porsche, hence, as a result, every year, the Chinese company launches a “Porsche Design” version with extra and advanced functions and also with technology that is only implemented in this special version. Even, apart from Huawei, the well-known Chinese smartphone manufacturer, of course, I am talking about Oppo who also did the same with Lamborghini and simply launched the Oppo Find X Lamborghini edition. Hence, simply by following this trend of other Chinese smartphone manufacturers, the well-known Chinese smartphone manufacturer, of course, OnePlus has announced on its website and on its Twitter account a statement which simply showing a collaborative agreement between OnePlus and the luxury car brand McLaren. of the cars. 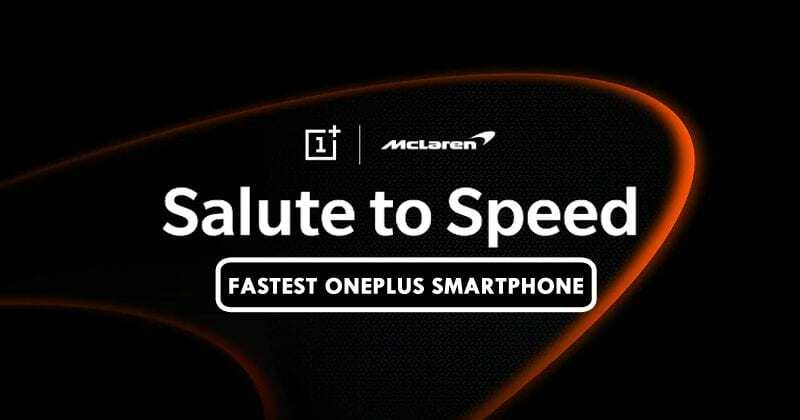 As the well-known Chinese smartphone manufacturer, OnePlus compares McLaren in terms of speed, but on their smartphone. In the four or five slides that appear on the OnePlus website, a comparison which is made between both companies and how they have similar objectives like innovative, creative, fast and perfection. Moreover, on December 11 at the McLaren Technology Center which is located in Woking, United Kingdom will be the day chosen by both companies to celebrate this event (December 12 in India). And on this event the well-known Chinese smartphone manufacturer, OnePlus will launch its McLaren edition of the OnePlus 6T. Now if we talk about the features that this special edition of OnePlus 6T will bring then let me clarify that the OnePlus 6T McLaren edition will feature a fingerprint sensor under the screen, a Snapdragon 845 SoC, 6 & 8GB of Ram options, 128 or 256GB of internal storage option, 3700mAh battery, and a 6.4-inch Full HD+ AMOLED display. As all these are previously mentioned specifications that we already have, but the most interesting thing is that it will feature something new and innovative. So, what do you think about this? Simply share all your views and thoughts in the comment section below. Click here to check out the official website of OnePlus to know more about the all new OnePlus 6T McLaren.